In the year 1912, the shipping industry had been competing for biggest, and luxury. The White Star Line was to build three grand ships, R.M.S Olympic, R.M.S. Titanic, and H.M.H.S Gigantic later to be named Britannic. Olympic was the first to be built, caught a lot of attention was eventually named "Old Reliable". Titanic was the second ship built by White Star Line, this ship was the grandest of all three, this ship was the largest, fastest, and most luxurious in it's day. This ship was said to be "Unsinkable" because it had water tight bulkheads on it, little did they know it wasn't full proof. This ship made it's maiden voyage in the beginning of April 1912, the ship had 2,227 passengers onboard. 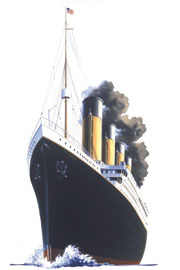 The ship was to head to New York and make the fastest time of any other record, but disaster struck when the Titanic hit an iceberg. Two hours and forty minutes later, the ship Titanic had laid underneath icy waters of the North Atlantic, 1,523 people had either been frozen to death, or drown. Now that you know a little about the Titanic here's all the facts and mysteries of the doomed ocean liner. 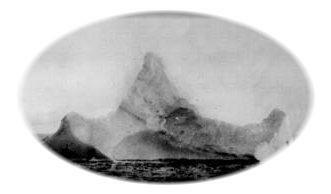 This web site is made for people interested in Titanic history. This web site is made for factual information about the real Titanic that sank April 15th, 1912. Question: Do you know if they are building a Titanic to be launched in 2002? If so where and how much are tickets?